Rohana has recently returned to painting with acrylics and oils. They are more direct and less time-consuming than the batik paintings. Rohana developed her batik painting style in the 1970's by integrating her knowledge of drawing, painting, printmaking, and design. Until the mid 80's she created large original batiks, limited edition wood-cut and silk-screen prints and acrylic paintings. With the help of a Canada Council grant she produced reproductions of her batiks which along with the originals sold internationally. 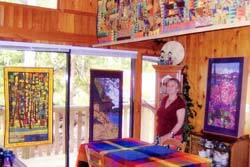 She also taught textile design, design and drawing at Kwantlen College (now Kwantlen University), Surrey campus. After working from her home studio on SaItSpring Island, in the mid 80's Rohana turned to a new venture as a United Church minister. Later, from 2001-2005, she worked for an inter-religious organization (Subud Spiritual Association) doing international travel. In 2003 she retired to devote more time for travel. Inspired during her travels to return to painting, Rohana began doing water-colour, acrylic and oil paintings on location in various countries. In creating art I seek out the shapes, patterns, lines, colours, values, textures and forms that fascinate me. Although my art is representational, my intention is more to celebrate the elements of two dimensional design than to create a photographic representation of what I see. I paint subjects that interest me both visually and emotionally, mostly landscapes and people doing things. I paint on location because I value the direct interaction between seeing and painting. When I work in the studio I work from paintings and photographs done on location so I can maintain my relationship with the subject There is a meaningful relationship between the subject, the eye, the hand, and the canvas or paper. I hope that when people see my painting they become part of that relationship. It is an expression of my belief that we are all One, all interconnected by the Spirit of Life.